Anthologies of collected works were a major feature of the Black Arts Movement or black arts era. Between 1968 and 1976, more than 60 anthologies featuring African American poetry were published. 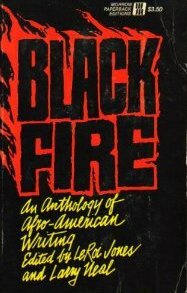 The interest in black people, culture, and artistic expression brought on in part by the visibility of the Civil Rights and Black Power Movements, along with the increased number of African American students in college and the rise of Black Studies programs, created a large demand for black-related books. Anthologies helped fill a void. 6 ways that black arts era anthologies shaped African American literary history. 1. 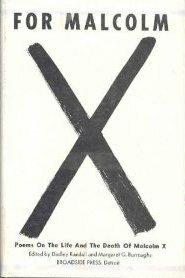 A platform for poetry and politics - Collections such as For Malcolm (1969) edited by Margaret Burroughs and Dudley Randall and Black Fire (1968) edited by Larry Neal and Amiri Baraka allowed editors and poets to highlight their political commitments. Even the titles of the books framed the content as militant or nationalist. The introductions for many black arts anthologies announced that the writers were dedicated to activist causes. 2. A united front - Mainstream anthologies had typically published one or two black writers at a time, effectively separating and segregating African American poetry from American (presumably white) poetry. The rise of so many anthologies featuring African American verse during the black arts era allowed for the publication of large numbers of black poets in a common site. The collections suggested a united front or sense of solidarity among African American literary artists, despite any differences that they may have had. 3. Establishing contemporary poets - Often, contemporary poets must wait decades before becoming established writers or widely recognized. Anthologies, however, helped a range of emergent or younger writers such as Haki Madhubuti, Nikki Giovanni, Carolyn Rodgers, and Sonia Sanchez become quite popular and situated within the broader discourse and history of African American literature. Baraka had already become fairly well known prior to the black arts era, but the movement really further established him as a major figure. 4. The recovery of elder and old poets - Anthologies of the 1960 and 1970s helped re-establish the presence of several poets from previous generations, including Phillis Wheatley, Paul Laurence Dunbar, Langston Hughes, Robert Hayden, Dudley Randall, Gwendolyn Brooks, and Margaret Walker. Those poets' works enjoyed their widest circulation during the height of the black arts era. 5. Key topics in black poetry - The publication of such a large number of anthologies and the circulation of so many poems during a relatively condensed amount of space served to highlight poets' interests in covering several overlapping topics, including music, race and anti-racism, black pride, and cultural history. There were also a large number of tribute poems published that honored Malcolm X, John Coltrane, and other important cultural figures. 6. Signature poems - The repeated publication of so many poems during a short period established individuals works as poets' signature or most popular pieces. Baraka's "Black Art" and "A Poem for Black Hearts," Nikki Giovanni's "Nikki-Rosa," Gwendolyn Brooks's "We Real Cool," Robert Hayden's "Runagate Runagate," and Margaret Walker's "For My People" each appeared in over a dozen anthologies in less than an 8-year span making those works and other ones signature poems for the poets.